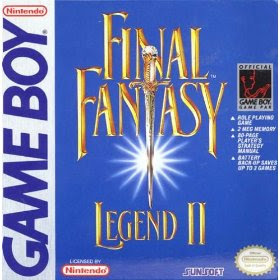 I had an urge to play old Game Boy games recently and so I went to one of my childhood favourites, Final Fantasy Legend II. If I recall correctly, I think my dad bought us the game when I was in grade 4 or maybe 5, so I was somewhere between 9 and 11. The game had such a lasting impact on me. It was an epic adventure filled with strange characters, unique combat and quite a memorable soundtrack. When you first load up the game, you're allowed to pick the character combinations for your party. There are humans. who are well-rounded fighters, mutants. who are adept at magic, robots. who are great with mechanical tools, and monsters. who have the ability to shapeshift after eating meat dropped by bad guys. The story is quite simple. There are pieces of magical fragments called MAGI scattered throughout the multiverse. You and your party traverse across all the different lands to recover these pieces of MAGI, to keep them away from the hands of evildoers. At the same time, you meet a supporting cast of characters who you'll have to help along the way. Through your adventuring you'll get to travel to such varied lands as a world for giants, a Japanese-like world and even inside a body of a mutant, just to name a few. Upon first glance, the game might look and play like a traditional console RPG. But once you start playing it, you'll realize that it isn't so. For example, the weapons, potions and spells that you use in combat have a limit on the number of times which you can use them, so you really have to watch that you're not doing too much grinding or it'll waste your items and also you have to be weary that you're not wasting good items on easy bad guys. It does make for some interesting strategies in that there are certain rare weapons that can only be found and not bought, so you end up really choosing your battles or else end up wasting your weapons. Another different aspect is the leveling system. Instead of experience points and the usual way of leveling up, the game opts for a randomized system. Your life total, strength, agility and mana stats are randomly increased after battles. But they don't always happen, so having bouts of no leveling is not uncommon. Because of the unique leveling system, the game can get difficult at times. I remember when I first played through it, I came across much difficulty, but even at my young age, I discovered a bug in the algorithm that allowed me to level my characters almost at will. It came in handy when I played it through again this time. This was a fun game, but maybe moreso because of the nostalgia factor than the actual fun-ness. It can be frustratingly tough at times, but if you can find a way to get through the rough patches, the game can feel quite rewarding. Til next time, later geeks!